2018 has been crazy, and all I really need is a tray full of éclairs. I don’t want to complain too much, because I’m very blessed to have a wonderful outlet to chat with everyone on, but we’ve all been there. In the past month, I’ve had a couple computer crashes, dropped or burned just about everything that I’ve tried to make, magically ended up with tons of corrupt photos for professional shoots with short deadlines. Y’all know what I’m talking about. Just one of those seasons. In hopes of forgetting all about these things, I decided to try my hand at one more bake (while utilizing plenty of Post-It notes to remind myself of hot pans, where the counter ends so I don’t spill another bowl, etc.). — Éclairs. 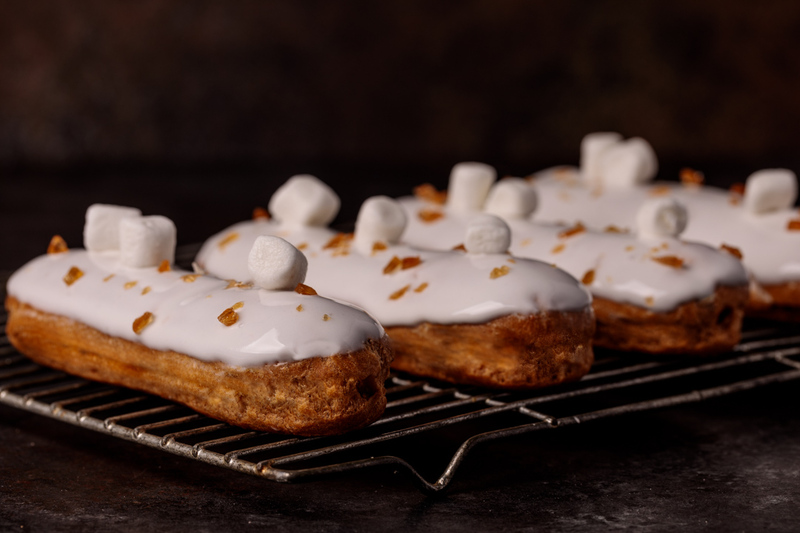 Eclairs filled with sweet potato pastry cream, topped with shiny marshmallow glaze and salted caramel sprinkles. 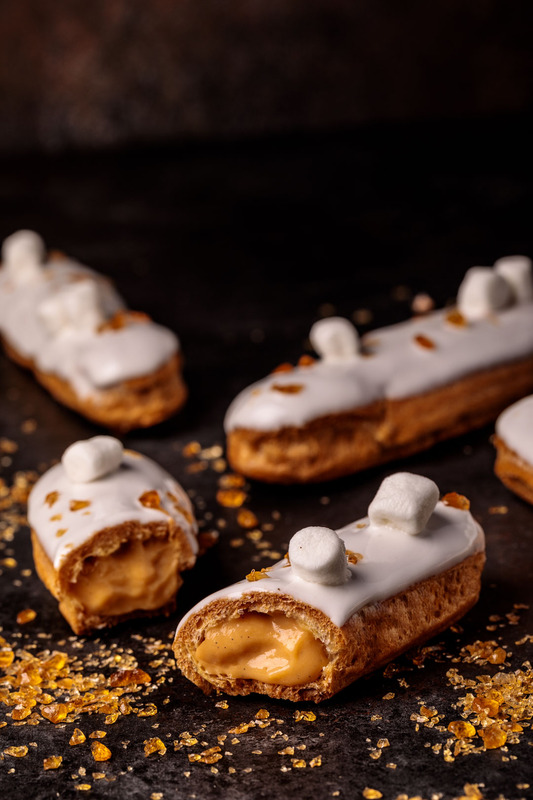 There is just something absolutely whimsical about éclairs to me. More than macarons, the 2012 cupcake rush, and all of the cookies in the world, éclairs are the pastry that I find myself returning to constantly. 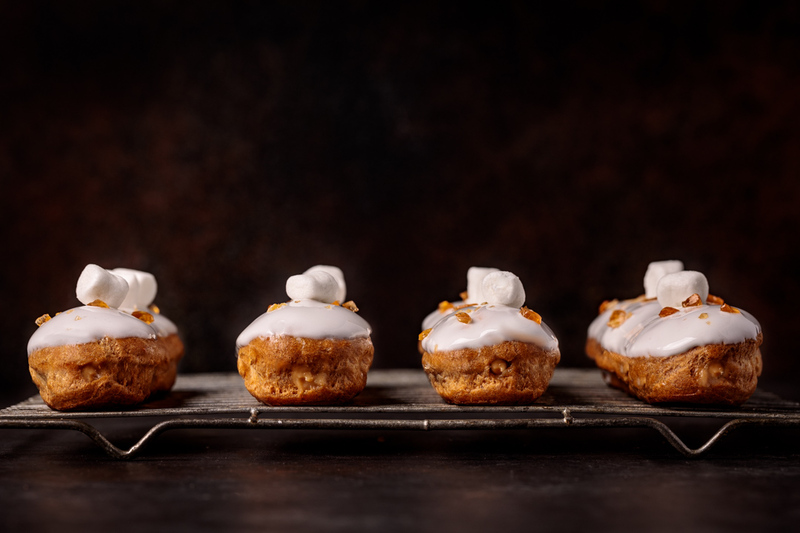 I hadn’t really realized how many different recipes for these long puffs that I have made until I started writing this post. I’ve only posted a couple others on here so far, but have about 10 or more in my nifty little kitchen notebook that I have yet to post. 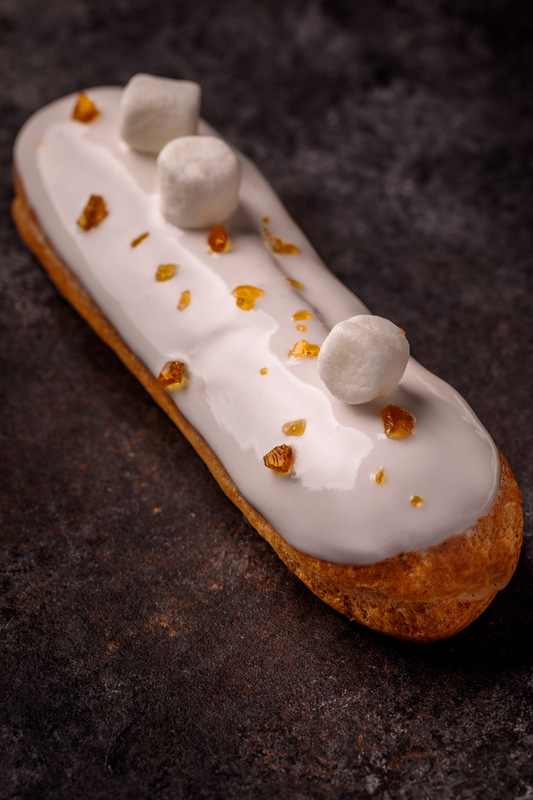 The base for éclairs is called choux pastry. Choux (pronounced like “shoe”), means cabbage in French. 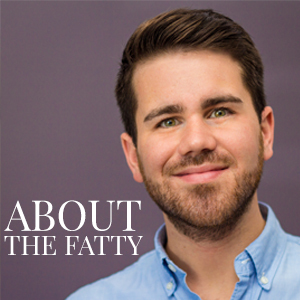 Think about those beautiful little cream puffs that you’ve all had. Basically tiny cabbages, right? 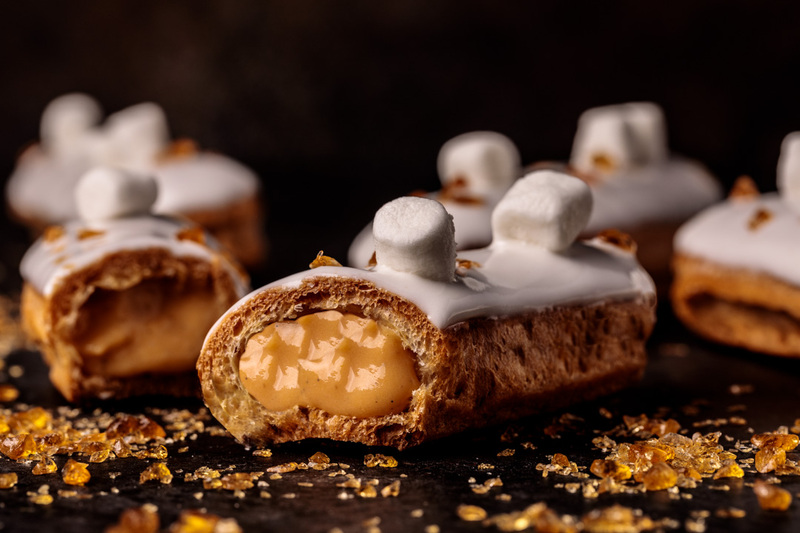 It’s arguably the most versatile base in pastry, with the ability to produce countless sweet and savory bites. 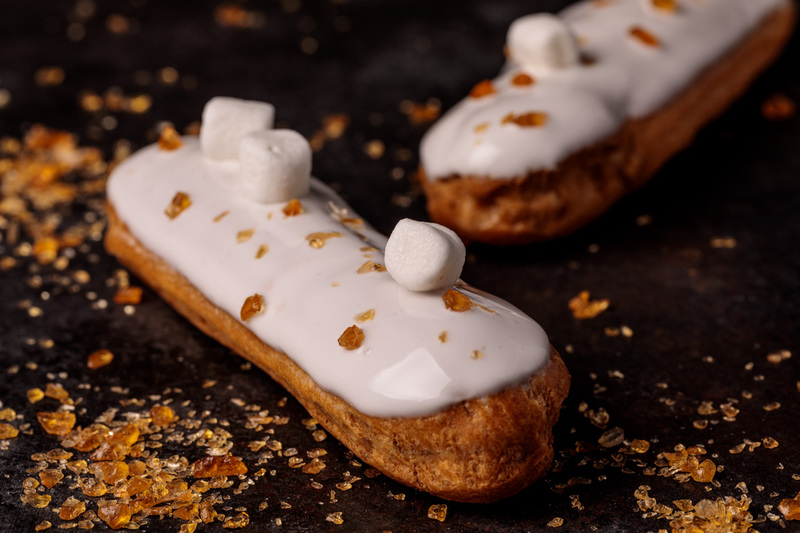 The basic idea behind choux pastry is that you cook a butter, flour, and water mix, add some eggs, and then pipe it to cook it again. This cooked twice method is quite unique, but allows for some amazing applications. Standard French pastry cream, crème pâtissière, is another recipe that will make everything perfect. I use the same base recipe all the time, with some additions and small changes depending on the flavor application that I’m going for. For this one, I’ve simply slow roasted some sweet potatoes to whip in. The caramelized sweet potatoes ended up being the perfect pairing with the rich, buttery pastry cream. I’m using the same marshmallow glaze that I created for the cinnamon marshmallow-iced shortbread cookies. It’s perfect for these because it doesn’t set to a brittle royal icing-like finish, but instead stays a bit puffy and soft. You get that beautiful shine and the distinct marshmallow nostalgia. 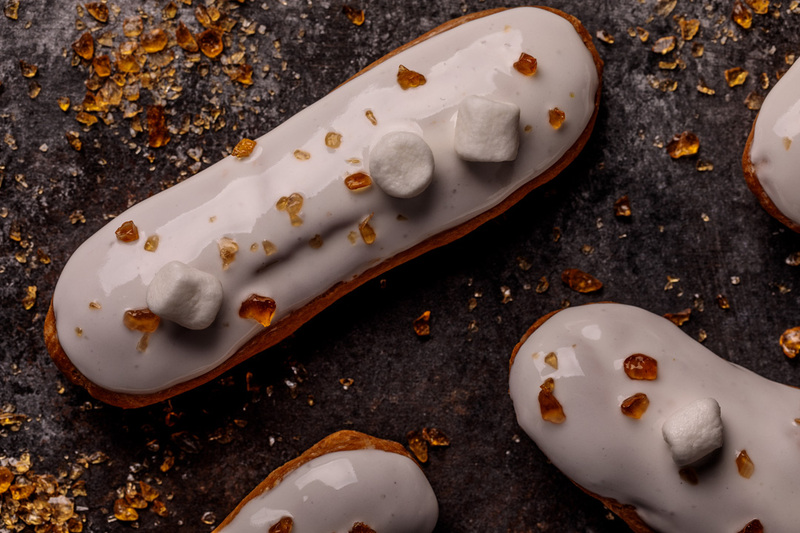 Sweet potato pastry cream filled French eclairs with a marshmallow glaze and salted caramel sprinkles. Recipe from SouthernFatty.com. Combine egg yolks and sugar in a bowl and whiskey until light, fluffy, smooth. Add cornstarch and salt to egg mixture and whisk well to combine. Set aside. In a clean medium saucepan, combine milk and vanilla. Bring milk mixture to a boil and immediately remove from heat. Whisking while adding, stream about ¼ cup of the hot milk mixture into the egg mix. Place milk back on medium heat and slowly add all of the tempered egg mix, continuing to mix throughout. Bring mixture to a slow boil, stirring and cooking for an additional 2-3 minutes to thicken. Move to bowl and cool until slightly warm, but not hot with plastic wrap directly on top of cream in bowl to prevent a skin from forming. Move to mixer with whisk. Beat in sweet potato until completely combined. Move back to bowl with plastic wrap on top and chill until completely cool. I strongly encourage you to weigh all ingredients. I use this kitchen scale. In a medium heavy-bottomed saucepan (for best results, don't use a non-stick coated), heat water, milk, butter, sugar, and salt over medium heat. While heating, weigh out flour and eggs. Once the milk/water/butter mix reaches a slight boil, remove from the heat (leave the burner on) and dump all of the flour into the mix at once. Stir quickly with a wooden spoon. Return to the heat and stir CONTINUOUSLY. You will start to see the dough pull away from the pan after a few minutes. Keep stirring vigorously, cooking for 2 minutes. You should be left with a slight film on the bottom of the pan. Remove the pan from the heat. Transfer the dough to a mixer with a paddle attachment. With the mixer on low-medium speed (about a 4 on a KitchenAid), add one egg at a time from the cup o' eggs that you have ready. Do not add another egg until the one you have just added is completely incorporated. Continue to mix until eggs are mixed well and dough is glossy and smooth. It will remain somewhat thick for piping. The dough should ribbon when it falls back on itself when finished. Transfer to a piping bag with an open or large tip. Alternatively, you can use a large star tip to cut down on possible cracks, which allows the dough to expand more easily. Prepare a baking sheet with parchment or a silicone baking mat. Pipe éclairs on the baking sheet. Press down any points on the any points with a damp finger. Beat egg wash together well and brush on top carefully with a pastry brush. Try to avoid egg on the baking sheet. 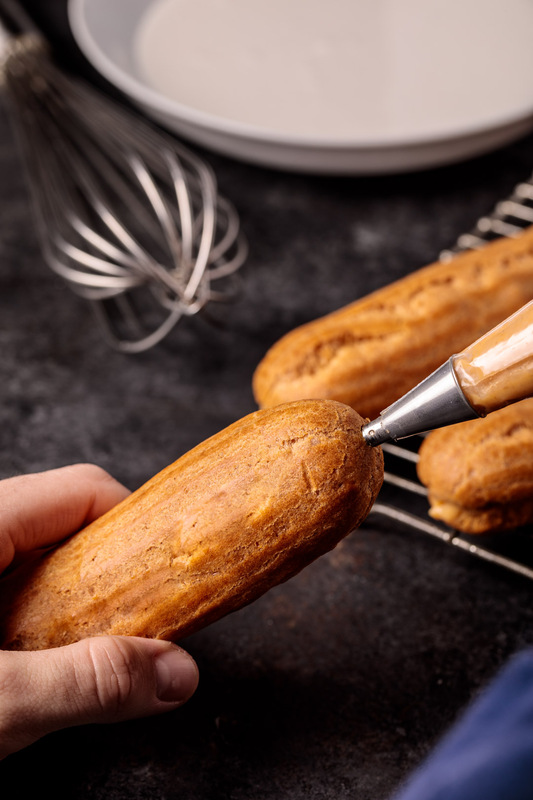 Optionally, mist the tops of the eclairs with water. This will help with ensuring they puff well. Bake for about 25 minutes, or until golden brown. Do NOT open the oven until you are sure they are golden and set in shape. When golden, prop oven door very slightly with a wooden spoon and lower temperature to 315. Cook for an additional 20 minutes to dry the puffs out. 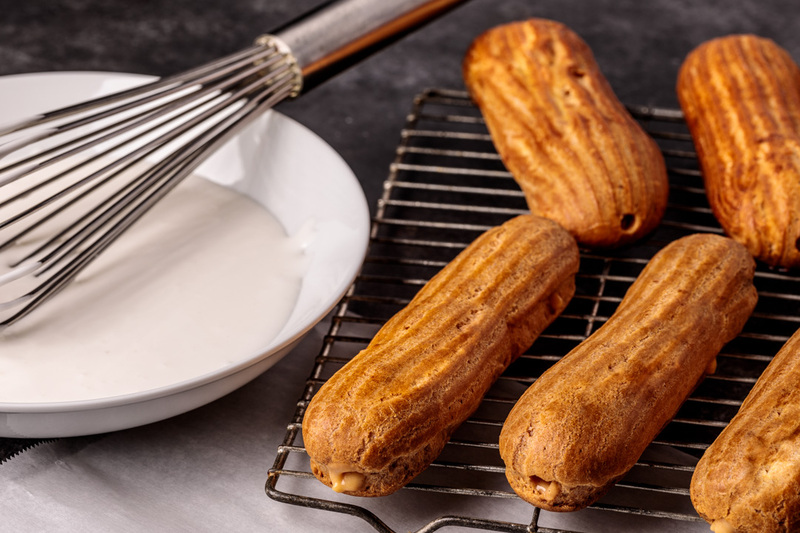 You can also just turn the oven off after about 20 minutes and allow the éclairs to finish and cool in the oven before removing. This is my preferred method, if time permits. In a separate bowl, add egg whites and cream of tartar (to stabilize). If mixture is too thin, add additional powdered sugar. Pipe pastry cream into eclair shells. I prefer to use THIS tip for piping the eclair. It makes it much more simple and clean. Dip filled eclair shells into the glaze. Finish with marshmallows and salted caramel sprinkles. 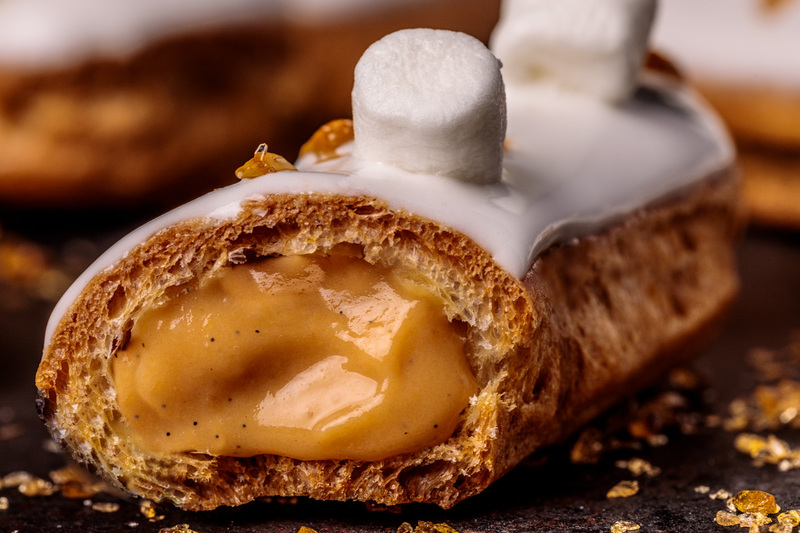 I’m not a fan of éclairs but it’s very creative to use sweet potato and marshmallow glaze ! I live near France so we have all kinds of éclairs here but it usually stays pretty basic (to me at least). Thanks! It was fun to make something a bit different. Awesome! I want to try these. Please do! They’re soooo perfect for fall. Sold I want eclairs. I know what you mean about having a season of What the HELL? I had that all of January! Oy! It’s been crazy. These def help! Thanks, Kitty! I had a blast making these.